The underlying assumption behind the television show 'Better Call Saul' is that it is a prequel to 'Breaking Bad'. However, nowhere on screen does it state that it is a prequel. There's actually more evidence to suggest that it is a direct sequel, with events taking place after those seen in 'Breaking Bad'. Most obviously, the very first scene of the show clearly takes place after Breaking Bad. Breaking Bad ends with Saul needing to change his name and go into hiding. 'Better Call Saul' opens with this new life working at a Cinnabon. This scene is in black and white, which is a technique usually reserved for flashbacks. This indicates that it takes place before the main body of the show, which takes place after this scene. In 'Breaking Bad', Saul needs to change his identity to hide from the police and anyone else who might come after him. 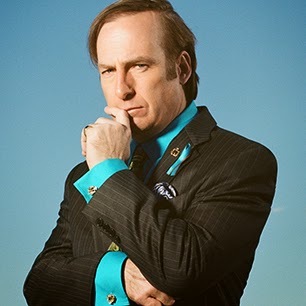 In 'Better Call Saul' we see that he has indeed changed his name from 'Saul Goodman' to 'Jimmy McGill'. There is no need for Saul to be living under a false name before he has the need to! Saul has embedded his disguise by pretending to be the brother of Chuck McGill. Chuck is a character who is clearly mentally unbalanced, believing himself to suffer from 'electromagnetic hypersensitivity'. As such he is easily manipulated by Saul into believing he is his brother, giving him credence. In the first episode, Saul goes to the house of the Kettlemans, prospective clients. However the Kettlemans are not present: instead the house is being haunted by the malevolent ghost of Tuco (who died in 'Breaking Bad' season 2). Eagle-eyed viewers will note that the character of Mike Ehrmantraut also appears in the show. Both Saul and Mike are noticeably older than in their 'Breaking Bad' appearances, cementing the idea that this series takes place approximately five years after 'Breaking Bad'. Mike never interacts with any character apart from Saul. This is because he is an angel, sent down from heaven after his death in 'Breaking Bad' to help guide Saul and so earn his wings. This is shown when Mike needs Saul's help to do the simple task of knock over a cup of coffee, as he cannot fully interact with the material plane. The only other characters who can see Mike are the two policemen (who are possibly angels monitoring Mike's progress) and Stacey, his daughter-in-law, who he must also help in order to earn his wings. Rumours for the show state that Jesse Pinkman may appear, thus revealing to the audience at large that this is in fact a sequel, as well as begin to resolve some of the supernatural elements that have cropped up.